On-field monitoring of head impacts, combined with finite element (FE) biomechanical simulation, allow for predictions of regional strain associated with a diagnosed concussion. However, attempts to correlate these predictions with in vivo measures of brain injury have not been published. This article reports an approach to and preliminary results from the correlation of subject-specific FE model-predicted regions of high strain associated with diagnosed concussion and diffusion tensor imaging to assess changes in white matter integrity in the corpus callosum (CC). 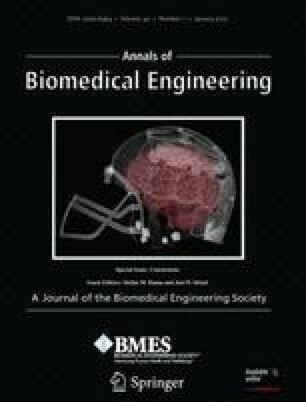 Ten football and ice hockey players who wore instrumented helmets to record head impacts sustained during play completed high field magnetic resonance imaging preseason and within 10 days of a diagnosed concussion. The Dartmouth Subject-Specific FE Head model was used to generate regional predictions of strain and strain rate following each impact associated with concussion. Maps of change in fractional anisotropy (FA) and median diffusivity (MD) were generated for the CC of each athlete to correlate strain with change in FA and MD. Mean and maximum strain rate correlated with change in FA (Spearman ρ = 0.77, p = 0.01; 0.70, p = 0.031), and there was a similar trend for mean and maximum strain (0.56, p = 0.10; 0.6, p = 0.07), as well as for maximum strain with change in MD (−0.63, p = 0.07). Change in MD correlated with injury-to-imaging interval (ρ = −0.80, p = 0.006) but change in FA did not (ρ = 0.18, p = 0.62). These results provide preliminary confirmation that model-predicted strain and strain rate in the CC correlate with changes in indices of white matter integrity. This study was supported through NIH RO1NS055020, R01HD048638, CDC R01/CE001254, the National Operating Committee on Standards for Athletic Equipment (NOCSAE 04-07 & SAC-1), and the William H. Neukom 1964 Institute for Computational Science at Dartmouth College. Richard M. Greenwald, and Simbex have a financial interest in the instruments (HIT System, Sideline Response System (Riddell, Inc)) that were used to collect the biomechanical data reported in this study. McKee, A. C., R. C. Cantu, C. J. Nowinski, E. T. Hedley-Whyte, B. E. Gavett, et al. Chronic traumatic encephalopathy in athletes: progressive tauopathy after repetitive head injury. J. Neuropathol. Exp. Neurol. 68:709–735, 2009. 10.1097/NEN.0b013e3181a9d503.